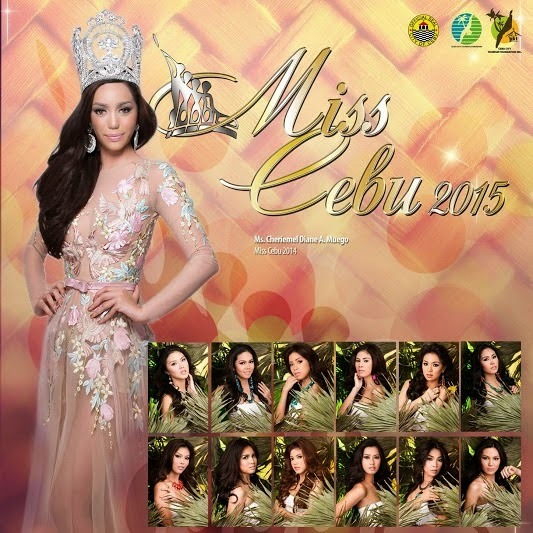 The 31st Miss Cebu Coronation Night will be held on Wednesday, January 14, 2015, 6:30 p.m. at the Pacific Grand Ballroom of the Waterfront Cebu City Hotel & Casino, telecast live on Studio 23 and streamed on http://www.cebucitytourism.org. The 12 ladies vying for the prestigious title are Hanica Rachael Arshia Ong, Febb Flores, Mary Cyrielle Wong, Aivy Mae Castro, Katherine Jumapao, Rio Liza Vestil, Lucena Rose Magdadaro, Catherine Mier, Rosalyn Clavano, Ma. Genefe Navilon, Domenic Reynes, and Wynonah Van Joy Buot. This year’s pageant theme is “REVVING UP CEBU”. More than thirty one years ago, Cebu proudly crossed the threshold of becoming the country’s most popular tourist destinations, an accomplishment that was by no means typical. It was the era of martial law, political rallies and stuff that tourists were not willing to experience. This island in the Pacific had mounted the Sinulog Festival just a few years before the eighties, its hotels and resorts, together with the Tourism Commission had mounted two sales blitzes in at least ten US cities inviting Filipinos to come home through chartered flights. In fact, direct-chartered flights from Osaka, Japan and several other points in Asia were a regular occurrence, bringing in tourists to enjoy the city’s historical and cultural attractions, golf courses, dining and entertainment offerings to complement the island’s beaches and spectacular dive sites. CEBU became a star. Tourism became a driving force, an economic engine of growth that continues to hum with a consistent power in the belly of this city. At about the same time in the past, the Cebu City Tourism Commission launched the search for the quintessential Cebuana to embody the indomitable spirit of the city that refuses to be intimidated by anything. Creativity, innovation, entrepreneurial drive, can do outlook and the willingness to collaborate and partner to make things happen- all coming to fore to meet challenges. Miss Cebu, in a sense, gave a face and a voice to this dynamic metropolis and the entire island as a major tourist destination, representing Cebuanos as one of the world’s friendliest and most welcoming. The stage is set for a spectacular show within a show featuring the best of Cebu and various entertainers including celebrity guest Tom Rodriguez. It will be hosted by Paulo Varela, Jonathan Cimafranca and past Miss Cebu winners. To highlight Cebuano creativity, the candidates will be wearing the creations of Cebu’s top designers with maquillage by the Make Up Artists Club of Cebu. For the opening number, the Miss Cebu beauties will be wearing “Pusô-inspired” creations by designers Alejandro Godinez, Barbie Alvez, Peewee Senining, and Rey Villegas. Another segment will feature the “Modern Maria Clara” with creations by Yvonne Quisumbing, Brian Aloquin, Protacio, and Edwin Ao. The glamourous evening gowns will feature the “Red Terno” as interpreted by Albert Arriba, Marichu Tan, Jun Escario, Ditas Rodriguez, Wendell Quisido, Philipp Tampus, OJ Hofer, William Manahan, Dino Llorren, Arcy Gayatin, Ren Manabat and Harley Ruedas. It will be an ode to how Cebu has revved up, grown and developed into the thriving metropolis it has become yet still manages to remain rooted in its rich culture and heritage, seamlessly blending old with the new, traditional with the modern, giving it its unique character. Tickets to the Coronation Night are now available at the online voting booths, Waterfront Cebu City Hotel & Casino and the Cebu City Tourism Office at the 2nd floor of the Rizal Museum and Public Library in Osmeña Boulevard and are priced at P500, P1,000, P1,500 and P2,000. Miss Cebu 2015 is presented to you by The Cebu City Government through the Cebu City Tourism Commission and Cebu City Tourism Foundation Incorporated. It is co-presented by. ABS-CBN Corporation, Ayala Center Cebu/Cebu Holdings, Waterfront Cebu City Hotel and Casino, Dr. Rhigel Jay Alforque Tan and Mr. Rey Amoguis Espina. Diamond sponsors are AMA Computer College Cebu – Mabolo Cebu, Gems and Designs, Marco Polo Plaza Cebu, Megaworld Cebu Properties Incorporated, NGenius IT Hub NK SERVICE CENTER, Philippine Airlines, and SM City Cebu. For more information, please contact the Cebu City Tourism Commission office at (032) 412 4355 or visit www.facebook.com/misscebupageant.